Today has not been a great day. I took a multivitamin on an empty stomach. This is almost guaranteed to make me throw up. And I fought the nausea for a good two hours, while feeding and tending my sweet babe. Yurk. Then we went out to work to sort out a few things and buy some screen doors for the retarded back glass ones we have. I don't think I've shared my frustration about these doors. They are recessed into a frame from the inside, but flush with the outside. But - there are bricks on the outside frame. So you can't open them outwards more than about 120 degrees. There is a good 5" drop down to the ground from the houes to the patio, so you have to have something tall and heavy to peg said doors back. But because of the bricks, you can't open them all the way. They open outwards, so there is no screen on the outside. Which means we have no screen on the doors, and that is frustrating as all get up. Oh and we have no screen on the front door, which means (a) we can't get a breeze through the house and (b) we have to open the door to see who's there. And they are practically inside the house before I open the door. So the owner of our house got a quote (or 5) for doors on the back of the house. Drama drama drama. All of the companies said "Nope, too hard - we will charge you like a wounded bull to put something Ugleh in". And so the owner said it was too hard. I went into work, found some DIY screen doors that were $38 instead of $200 (because they were taken out of stock in 2008 and we've been trying to get rid of them for 2 years! ), bought 2 and am going to have a look at the instructions in a second. So we might have screen doors tonight! 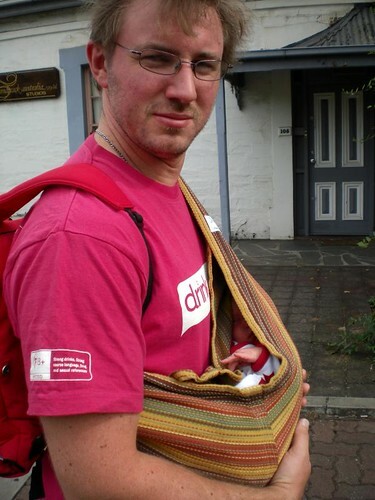 So ANYWAY - I went to work and Sally was in the sling with Osk (here's a photo of a baby wearing dad. Not from today but a great pic all the same! He gets hit on something shocking with her in a sling!). And still people were able to touch her enough to leave her STINKING of crap nasty aftershave. Which meant when I went to sniff her on coming home, she didn't smell like my baby and it gave me a migraine. Erk. I'd forgotten how sensitive I can be to things like that. It's weird when your children don't smell of you. I remember really noticing that when we first sent our older son to a childminder for the day.